Evaluate effectiveness of crystal violet stain for staining of MFs and its comparison with routine hematoxylin and eosin (H and E) stain. 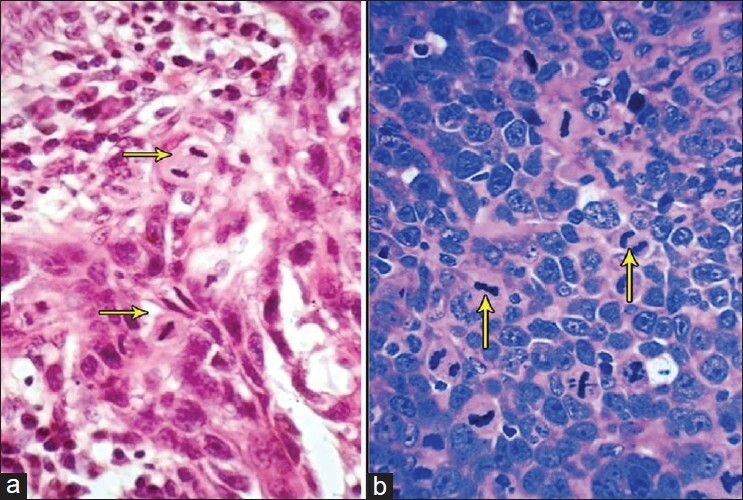 Counting of mitotic figures and its comparison between H and E stained tissue sections and crystal violet stained tissue sections diagnosed as OED and OSCC. The study sample includes archival tissues embedded in paraffin blocks diagnosed as OED (n = 30) and OSCC (n = 30). The control group comprised of tissue specimen from oral mucosa of young (17-35 years) healthy volunteers (n = 30). Written consent was obtained from each healthy volunteer after necessary instructions and information about the study. For the control group, a biopsy was obtained from retro molar mucosa and from gingiva. These tissue specimens were formalin fixed, routinely processed and paraffin embedded. The study was approved by institutional ethical review board (IRB). Group I: Control group, comprised of 30 healthy volunteers(normal oral mucosa). Group II: Comprised of 30 cases of OED. Group III: Comprised of 30 cases of OSCC. Diabetes mellitus (DM) and hypertension will affect the rate of mitosis through altered metabolism of cell and oxygen supply, respectively. Patients with bleeding disorders were could not be treated/operated at our hospital setup and so they were referred to the higher referral centers. Because of above mentioned reasons cases of systemic diseases like DM, hypertension, and bleeding diathesis were excluded from study. Broader's grading system (1927) for OSCC,  which grades OSCC as well differentiated (WDSCC), moderately differentiated (MDSCC) and poorly differentiated OSCC (PDSCC), was used to assess cases diagnosed of OSCC. In case of OED, WHO grading system (1978) was used.­ This system grades OED into three grades as mild epithelial dysplasia (MIED), moderate epithelial dysplasia (MOED) and severe epithelial dysplasia (SED). The nuclear membrane must be absent indicating the cells have passed the prophase. Clear, hairy extension of nuclear material (condensed chromosome) must be present - either clotted (beginning metaphase), in a plane (metaphase / anaphase) or in separate clots (telophase). Two parallel, clearly separate chromosome clots to be counted individually as if they are separate mitoses. Each slide was observed by two separate observers without any exchange of information regarding study sample details. Observations made by each observer regarding number of MFs were recorded separately and average value was calculated for both observations. Data obtained was statistically analyzed by using the Man-Whitney U test. P-value of <0.05 was considered as statistically significant. All the data analysis was done using the Statistical Package for Social Sciences (SPSS) [Version 10]. The total number of study sample for the present study was 90. For group I, 18/30 (60%) were females and 12/30 (40%) were males. For group II, 11/30 (36.7%) were females and 19/30 (63.3%) were males. For group III, 17/30 (56.7%) were females and 13/30 (43%) were males. For group I, biopsy tissue was obtained from a retro molar area 18/30 (60%) and gingiva 12/30 (40%). In group II and III subjects, biopsy site was buccal mucosa for 20/30 (66.7%) and 18/30 (60%), respectively. When frequency of mitotic figures was compared among three groups and with both staining methods, there was significant (P < 0.01) increase in number of mitotic figures observed in group II [Figure 1] and group III [Figure 2] in comparison with group I [Table 1]. There was no significant increase in mitotic figures when compared with OED (group II) and OSCC (group III) for both staining methods (for H and E stain P = 0.06 and in case of crystal violet stain (P = 0.17). There was a highly significant (P < 0.01) increase in number of mitotic figures in sections stained with crystal violet stain, when compared with H and E stain [Figure 2],[Table 2]. 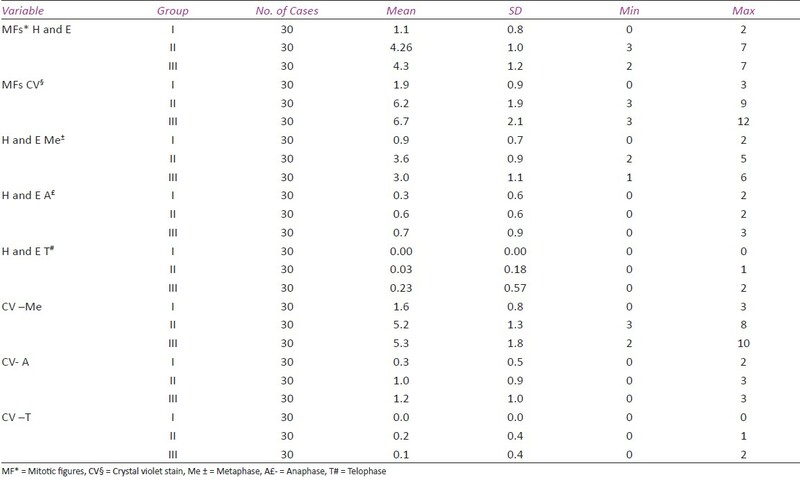 There was a significant (P < 0.01) increase in metaphase observed in crystal violet stain when compared with H and E stain for all three groups [Table 1]. If we focus on OED, the results exhibited that, there is a significant increase in mitotic figures from MIED to SED in case of H and E (P < 0.01) and crystal violet (P < 0.01). In the case of group III, there was a significant (P<0.05) increase in mitotic figures in MDSCC in comparison with WDSCC when stained with crystal violet stain [Table 3]. Increased and abnormal mitosis indicates genetic damage. This is an important feature seen in precancer and cancer. Thus, identification and quantification of mitotic cells forms an indivisible part of the histological grading systems used for prognostication of precancerous and cancerous lesions. Various authors like Mehta et al. 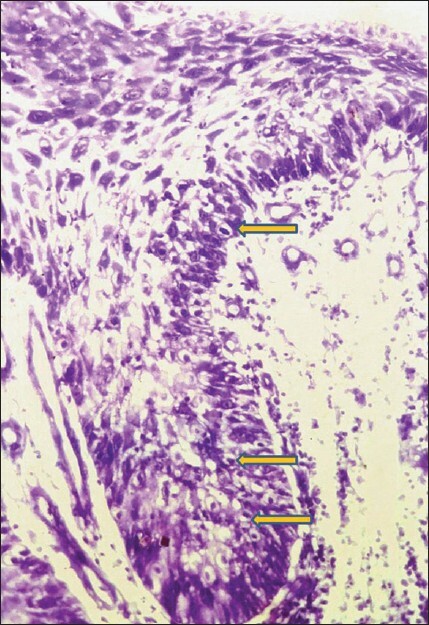 (1971),  WHO (1978)  have shown importance of mitotic figures in oral epithelium for diagnosis and grading of oral epithelial dysplasia. Recently, Warnakulasuriya et al. (2005)  have given criteria for diagnosis of oral epithelial dysplasia, where they have included increased number of mitotic figures as cytological criterion for diagnosis of oral epithelial dysplasia. So in this study we had decided to include oral epithelial dysplasia also. For group I, (control group), a majority of subjects were between 17 to 35 years of age. The age of control subjects is not matching with study subjects because it is well known that turn over time of epithelium increases as the age advances in other words active nature of epithelium is decreases. Since epithelium is highly active and proliferative type in oral cancer and precancer, for a comparison of such active epithelium we need to have controls with active epithelium which is seen in young individuals. So in this study, control subject's age is lesser compared to study subjects. Ankle et al. have showed that average mitotic figures in normal oral mucosa in control subjects were zero, contrary to this finding, the present study has shown that the mean frequency of MFs in control subjects was 1.1 for H and E stain and 1.9 for crystal violet stain [Table 1]. The reason for observation of varied frequency of mitotic figures in control subjects can be attributed to active nature of epithelium. The present study has shown that in case of OSCC group (group III), the mean mitotic count of 4.3/30 fields was obtained in the H and E sections (SD = 1.2) while a mean mitotic count of 6.7/30 fields was obtained in the crystal violet stained sections (SD = 2.1). In case of OED group (group II), the mean mitotic count of 4.26/30 fields was obtained in the H and E stained sections (SD = 1.0) while a mean mitotic count of 6.2/30 fields was obtained in the crystal violet stained sections (SD = 1.9). These finding are correlating with study carried out by Ankle et al. (1) though they have counted 15 microscopic fields as compared to 30 microscopic fields in the present study. The reason for counting more number of microscopic fields is justified by the fact that as we count more number of microscopic fields the count obtained will be more precise and valid. More number of MFs was observed in crystal violet stain. The reason could be attributed to the qualitative comparison between crystal violet stain and H and E stain. Crystal violet stain clearly stains the chromosome leaving cytoplasm clear and unstained due to hydrolysis of tissue sections by HCl at 60°C [Figure 2]b. This will help in easy identification of mitotic figures and also offer a more reliable counting. The significantly increased mitotic counts with 1% crystal violet [Table 2] and [Table 3] suggests that this stain provides a crisp staining facilitating the identification of mitotic figures even at a lower magnification as compared to H and E stained section [Figure 1]. Use of 1% crystal violet also eliminates the erroneous inclusion of pyknosis [Figure 3], apoptosis and karyorrhexis as mitotic figures, thereby eliminating false positive results, hence providing an easy discrimination. The reason for observing more number of mitotic figures in metaphase as compared with anaphase and telophase [Figure 2] is not clear. It can reasonably be answered as the appearance of chromosome clump in the equatorial plane helps us in identifying it easily when compared to anaphase and telophase. Various researchers like Gander and Mayer, (2) Vanstratten et al, (4) Chieco et al(5) have tried to stain the mitotic figures with two different histological stains. Gander and Mayer had conducted a study on semi-thin sections of buccal and palatal mucosa, which were stained with 2% malachite green in 50% ethanol at 80° C and post stained with 0.05% crystal violet in Sorensen's phosphate buffer (pH 6.4) at 45° C. Nuclear envelope and chromatin stained vivid purple in contrast to the surrounding green cytoplasm and cell borders. The distinct and differential staining of each of these components facilitates easy recognition of mitotic figures in oral epithelium. In another staining method by Chieco et al. with 1% crystal violet with nuclear fast red as counter satin so that mitotic figures stands clearly against red background. In above staining methods one thing should be noticed that these methods require preparation and staining with two different stains, which is added extra work and time for staining. In the present study, only one stain is employed in comparison with other previous methods. Comparing the reliability and feasibility of other methods and newer techniques, the use of 1% crystal violet stain is the cheaper, easier, speedy and most feasible staining techniques for even a small scale laboratory, for the localization of mitotic figures and assessing proliferation. It can be reproducible when precisely standardized staining techniques and identification criteria are strictly followed. This study is leaving behind the footprint whereon, one can walk with a large sample size, in order to standardize the selectivity of crystal violet stain for mitotic figures. We recommend that 1% crystal violet stain should be routinely employed in day today practice for identification of mitotic figures. 1. 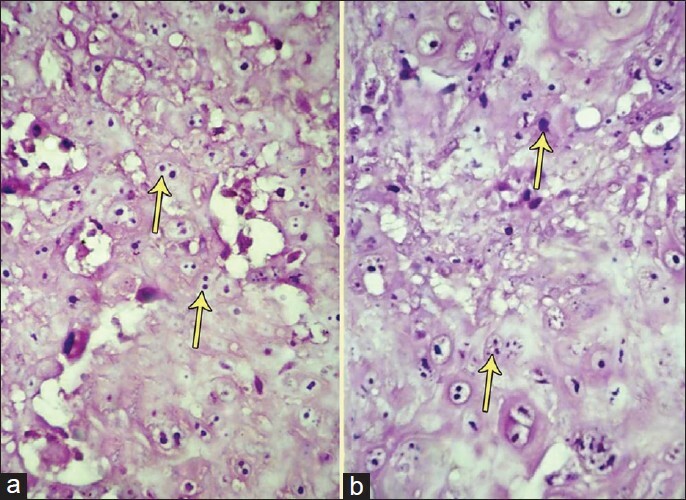 Ankle M, Kale A, Charanthimath S. Comparison of staining of mitotic figures by haematoxylin and eosin stained crystal violet stain in oral epithelial dysplasia and oral squamous cell carcinoma. Indian J Dent Res 2007;18:101-5. 2. Gander D. W, Meyer J. A simple two dye basic stain facilitating recognition of mitosis of plastic embedded tissue sections. Stain Technol 1988;63:75-81. 3. Fraser FJ. A selective stain for mitotic figures particularly in the developing brain. Stain Technol 1982;57:219-23. 4. Vanstratten H, Hekking J, Drukker J. A. HCl-Toluidine blue staining procedure specific for nuclei, mitotic figures and axons in GMA embedded embryonic neural tissue. Stain Technol 1976;12:360-2. 5. Chieco P, Pagnoni M, Romagnoli E, Melchiorri C. A rapid and simple staining method, using Toluidine blue for analyzing mitotic figures in tissue sections. Histochem J 1993;25:569-77. 6. Lamerton LF. The mitotic cycle and cell population control. J Clin Path.1974; 27(Suppl.7):19-25 . 7. Anneroth G, Batsakis J. Review of literature and recommended system of malignancy grading in oral squamous cell carcinomas. Scand J Dent Res 1987;95:229-49. 8. W.H.O Collaborating center for oral precancerous lesions. Definition of leukoplakia and related lesions: An aid to studies on oral precancers. Oral Surg 1978;46:518-39. 9. Godkar PB, Godkar DP, editors. Text book of Medical Laboratory technology. 2 nd edition. Mumbai: Bhalani Publishing House; 2003. 10. Van Diest PJ, Baak JPA, Matze-Cok P, Wisse-Brekelmans ECM, van Galen CM, Bellot SM, et al. Reproducibility of mitosis counting in 2469 breast cancer specimens: Results from multicentre morphometric mammary carcinoma project. Hum Pathol 1992;23:603-7. 11. Reibel J. Prognosis of oral pre-malignant lesions: significance of clinical, histopathological and molecular biological characteristics. Crit Rev Oral Biol Med 2003;14:47-62. 12. Mehta FS, Pindborg JJ, Hamner JE. Oral cancer and precancerous condition in India, 1971, Tata Institute of Fundamental Research, Mumbai, Munksgaard, Copenhagen 1971; 113-26. 13. Warnakulasuriya S, Reibel J, Bouquot J, Dabelsteen E. Oral epithelial dysplasia classification systems: predictive value, utility, weaknesses and scope for improvement. J Oral Pathol Med 2008;37:127-33.